Ashok Kumar (28 May 1956 – 15 March 2010) was an Indian-born British Labour Party politician who was the Member of Parliament (MP) for Middlesbrough South and East Cleveland from 1997 until his death shortly before the 2010 general election. Dr. Ashok Kumar's education and career include: studying at Rykneld School for Boys in Derby and at Aston University, where he obtained the degrees: Chemical Engineering (BSc); Process Analysis and Control Theory (MSc); and Fluid Mechanics (PhD). Dr. Kumar was also a Research Fellow at Imperial College, London, and a Research Scientist for British Steel. Roles Dr. Kumar has served in include being a Fellow of the Institution of Chemical Engineers and a member of the Institute of Energy. 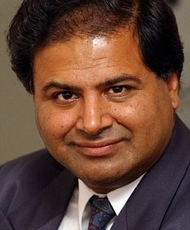 Parliamentary roles included being a Member of Trade and Industry Select Committee, Member of Science & Technology Select Committee, Chair of All Party Parliamentary Group for the Chemical Industry, Parliamentay Labour Party Treasury Committee.Kumar has also had published work in scientific and mathematical journal. His previous Parliamentary Career includes being MP for Langbaurgh (by-election) 1991-92. His roles included PLP Trade and Industry Committee, PLP Treasury Committee, PLP Education and Employment Committee, PLP Job Creation Group and Chair of the Parliamentary Office of Science and Technology. He was the Parliamentary Private Secretary to the Rt. Hon. Hilary Benn Secretary of State for International Development.